MS Dhoni is the best and coolest captain of current India cricket squad. This article gives you complete information about MS Dhoni. Biography and profile of MS Dhoni is included in this article. Career history, Awards and performance of MS Dhoni is also quoted in this article. The full name of MS dhoni is Mahendra Singh Dhoni who was born in the year 1981 July 7 at Ranchi, Bihar (now in Jharkhand), India. Dhoni was the current Captain of Indian cricket team. Dhoni is famous for coolest captain of India in any format of the cricket. Dhoni is also a best wicket keeper in India. 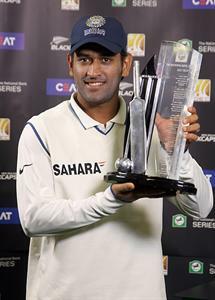 The main achievement of MS dhoni is the 2011 ICC world cup where India lifted the trophy Under Dhoni's Captaincy, and also he had played a crucial innings in the final of ICC world cup 2011 against Sri lanka which made India to win the final match. Other notable achievements under Dhoni's captaincy are that India won 2007 ICC world T20, CB series 2007, Border Gavaskar trophy 2008 and Australia series in 2010 and the important 2011 ICC world cup. MS Dhoni started his one-day career against Bangladesh in the year 2004, but the start was not good for him as he was out for a duck in the debut. His batting skills was firstly shown against Pakistan which is his second series after Bangladesh tour and scored 148 runs from 123 balls which is a record for Indian wicket keeper for highest score by a Indian wicket keeper. Dhoni again showed his brilliant batting the year 2005 against Sri Lanka where Dhoni scored a match winning innings of 183 runs from 145 balls. In 2007 Dhoni was appointed as the captain of Indian T20 and won the ICC world T20 2007 under Dhoni's captaincy. 2009 was a great year for Dhoni where he scored 1198 runs in that year. Dhoni started his test career in the year 2005 against Sri Lanka where he scored 30 runs in his debut. In the second test, Dhoni scored his first half-century against Sri Lanka. Dhoni scored his first test century in the year 2006 against Pakistan. In 2009 Dhoni again showed his batting strength by scoring two centuries against Sri Lanka and won the series 2 - 0.